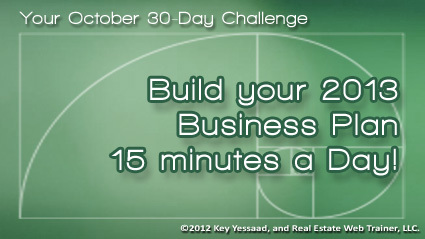 Your October 30-Day Challenge if you are in Business for yourself. You have heard of 30-Day Challenges, they are repeated and focused daily tasks that help you develop good habits, by working on meaningful ideas a few minutes daily for thirty days. Done well these 30-Day challenges can help you breakthrough and bring about success, clarify your conditions, and create progress in your business. Your challenge in October, if you choose to take it, is: ‘Build your 2013 Business Plan the Right Way’; here is how; 1. Get yourself a composition book to jot down your notes, or use something like evernote so you can capture your thoughts. 2. Spend 15 minutes daily, as early in the morning as you can, daydreaming about what your business will look like in 2013, and jot down any thought, imagination, vision, activity, tools you need to get, goals you wish to accomplish, trips you want to take, earnings you wish to accrue, family time you wish to enhance, anything that can relate directly to your business growing meaningfully next year. You must write down any call to action your mind tells you is in your best interest, and don’t be afraid of going into the fantasy of success – you will be able to ground it with activities once your vision has clarified. 3. Finally organize your vision and activities into a plan of action, and place them as activities in your Calendar – then act on them methodically. This is your 30-Day Challenge for October – I hope you will take it on; I promise it will be one of the best things you have done in a long time, and go ahead and share this challenge with your colleagues and collaborate with them – there is power in group activities.